Phoebe Tonkin first established a solid credential as an actress, playing Cleo Sertori in the television series H2O: Just Add Water and she didn’t stop there, she went on to pick up prominent roles in more high-grossing shows like The Secret Circle and The Vampire Diaries as well as its spin-off series The Originals. The Australian beauty is also a trained dancer and an accomplished model and has appeared on glitzy magazine covers like Girlfriend, ELLE Australia, and Teen Vogue. She was able to achieve several career milestones with the complete support of her parents who encouraged her to follow her dreams right from an early stage. Tonkin was born on 12 July 1989 in Sydney, Australia, with the full name Phoebe Jane Elizabeth Tonkin. Her parents – Nicholas Tonkin (father) and Jannyfer Tonkin (mother) raised her alongside one sibling – Abby. She grew up in a very supportive family, thus, her career in entertainment kicked off very early. As early as age four, she started taking dance courses in classical ballet, hip hop, contemporary dance, as well as tap dance and by the time she turned twelve, Phoebe was already taking courses at the Australian Theatre for Young People (ATYP) at the Wharf Theatre. Her formal education background can be traced to Queenwood School for Girls. Aside from being an actress and a model, Phoebe Tonkin is also a health enthusiast as portrayed in her co-owned website known as YourZenLife. Tonkin made a grand entrance into the acting world after she joined the cast of the Australian children’s television series H2O: Just Add Water where she starred as Cleo Sertori. Though she was cast in 2005, the series wasn’t released until 7 July 2006 on Network Ten after which it was taken to a bigger audience of about 250 million worldwide. The finale aired in 2010 after three seasons. Two years after her debut, Phoebe scooped a nomination for Best Lead Actress in a Television Series at the Australian Film Institute Awards. She continued to get roles in other Australian TV shows including Packed to the Rafters and Home and Away and in 2010, she appeared in her first film Tomorrow, When the War Began, an Australian action-packed movie. She was supposed to reprise her role as Fiona Maxwell in the sequel but the production never took off. Her home country wasn’t enough for the young and quickly rising star actress as she then left Australia in January 2011 to Los Angeles, in search of opportunities to make it on the international scene and she did just that. A few months after her relocation, Phoebe made the cast of The CW supernatural drama series The Secret Circle. Her role as Faye Chamberlain was met with rave reviews with critics pointing her out as the breakout star of the series. More so, Variety named her on the list of “new faces to watch” while E! Online listed her as one of 2011’s breakout TV stars. Sadly, the show only made it through the first season and was canceled on 11 May 2012. Later in 2010, Phoebe joined the cast of 3D horror film Bait 3D. A year later, she landed the recurring role of Hayley as part of the cast of The CW television hit series, The Vampire Diaries alongside the likes of Paul Wesley, Nina Dobrev, Ian Somerhalder, Steven R. McQueen and Joseph Morgan. The series was a commercial hit and was loved worldwide, thus, she received more international recognition through it. The Originals, a spin-off series of the Vampire Diaries also had her on set. Recent movies she has appeared in include Freeka Reeka Sheeka Deeka and the Big Battle in the Fores and Final Stop, both in 2018. She also has 2018 series like Safe Harbour and The Affair to her credit. As a model, Phoebe Tonkin can be remembered for her appearances in advertisements like Vauxhall Motors. She was signed to Chic Management and has worked with some top magazines like Girlfriend, Teen Vogue, Elle Australia, Complex, Miss Vogue, Vogue Australia, Dolly and Free People, to mention a few. In 2015, she began appearing as the face of swimwear line “Matteau Swim” by New York-based stylist Ilona Hamer and equally launched the lifestyle clothing line for Witchery the same year. She worked on the ad campaign “Journey To The Wild Side” to promote a new product for Smythson in 2017. Phoebe has also worked with Chanel on several occasions, aside from photoshoots, she is a Chanel brand ambassador. 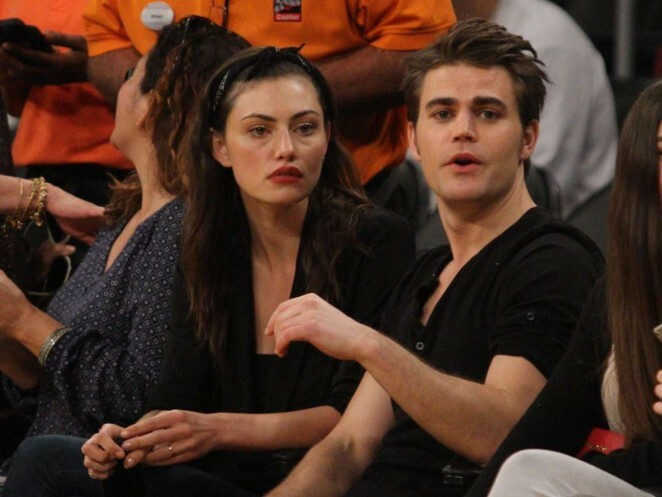 For what it’s worth, Phoebe Tonkin is not big on making her love life a public affair. Nevertheless, she couldn’t have hidden the fact that she and Vampire Diaries co-star Paul Wesley have been together since 2013. The lovebirds have not made any known move to take the relationship to the next level. Being a model and a fitness lover, nothing short of fabulous is expected of Phoebe Tonkin’s body and she hasn’t disappointed. She rocks an impressive height of 5 feet 9 inches and weighs a perfect 56 kg. She wears a bra size of 34B, a shoe size of 8 (US) and a dress size of 4 (US). Furthermore, she sports dark brown hair and a pair of beautiful hazel eyes.